Got my first Monarch butterfly of the season today. I don't know what it is about my part of New Jersey. We don't see Monarchs here ever until August, while everyone else I know in the state sees them in May/June. I think it's because the primary migration up north fallows the coast line and they cross the Delaware River early on. Liatris ligulistylis was the big winner again. It blooms just as the Joe Pye Weed, seen in the back, finished it's bloom. I bought loads of this Liatris this year from Prairie Moon Nursery but I believe greenhouse conditions stunted their growth or triggered them all to go into shock or something. Better luck next year I guess. Thankfully the one from last year came back and bloomed again. Another one that had been dormant last year also came up and has bloomed. Note the black spot on the middle of the hind wing; this was a male. He spent a good amount of time on this plant. Every time I scared him away he'd circle the yard then eventually come back. I was surprised to see he didn't go for the Cup Plant as all the Tiger Swallowtails are going for. In the future populations of butterflies and the foods they go for will be neat to observe. 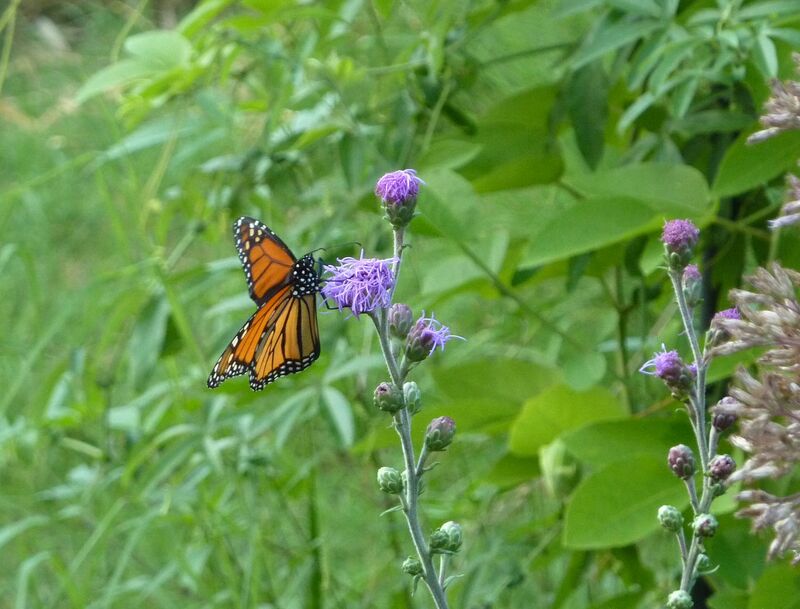 Milkweed for the Monarch was the first host plant I installed and clearly they like late blooming Liatris, and New England Asters. Tiger Swallowtails already have established host plants only a few houses away. My neighbor has a huge Tulip Tree in their yard and behind my garden another neighbor has a Black Cherry Tree which are both host plants (I think). They come into the yard to forage and I never get to see the caterpillar stage. Other host plants I'm still establishing are Spice Bush, Pipe Vine, Wild Senna, and Paw Paw. I have Golden Alexander too which is in the Carrot Family but have never seen the caterpillar it attracts. These will one day attract the Spice Bush Swallowtail, Pipe Vine Swallowtail, Zebra Swallowtail, Black Swallowtail, and Cloudless Sulphur. And then of course there's the Red Spotted Purple but it's host plants range from Apple, Ash, Willow and are on par with Tiger Swallowtail for me, with to many tall trees in it's host pallet. I have a few of them but it's such a broad range of tall trees it's more a matter of being in the area or not. 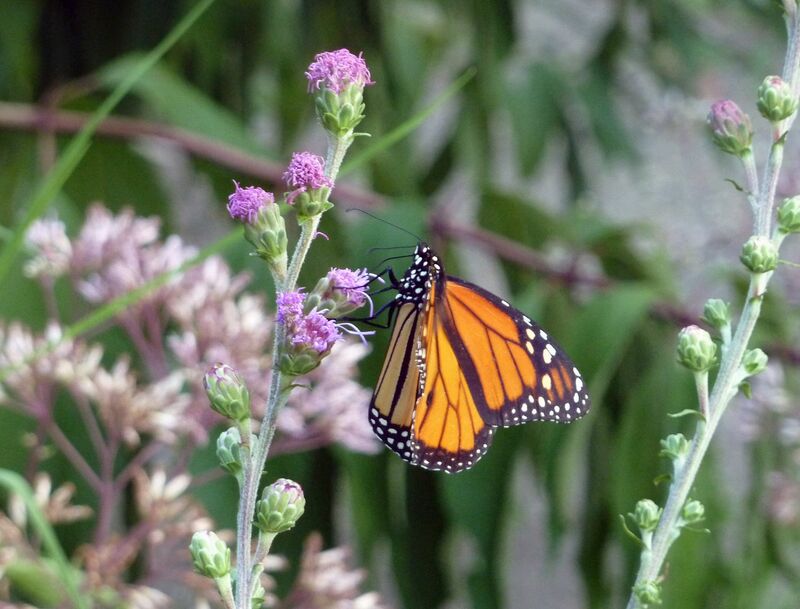 Many of these over winter in the pupa stage and hatch out in the spring as adults while others are migratory and have seasons like the Monarch.